Year of Young People Creative Funding recipients unveiled. Aberdeen City Council £100,000 funding initiative will be able to realise their creative projects in the fields of music, drama and other areas of the arts to help celebrate Year of Young People 2018. Picture of (L-R) Finley Campbell, Marie Main, 10, Councillor Lesley Dunbar, Kate Davidson, Chelsea Middleton, 12, Ashlin Irvine, 13. Picture by Kenny Elrick. Last night 15 youth organisations and five youngsters were given a total of £84,202 from the local authority’s £100,000 Year of Young People fund. The pot, which was set up following the council’s decision to withdraw its annual funding to the decades-old AIYF in November, was made available to celebrate the 2018 Year of Young People. A range of grants, from £750 all the way up to £10,000, have been given to a large variety of different projects throughout Aberdeen. One of the recipients is the Printfield Community Project, which will use a £5,745 grant to put on a musical performance. Amanda Pirie, youth work coordinator for the project, said: “We do a lot for local young people, but this will be the first time we will be able to do something like this, and we couldn’t be more excited. 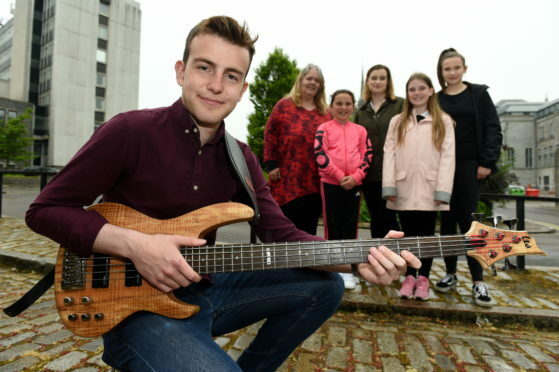 The vice president of Aberdeen University Jazz, Finley Campbell, said his organisation will use their £7,450 of funding to organise a festival, and even perform in schools around the city to encourage more youngsters to discover music. Mr Campbell, 18, said: “We’re really, really grateful to be able to access this kind of money. The rest of the £100,000 funding pot will be allocated through further grants available to young people aged between 16 and 25, and a special Year of Young People showcase event.